Named after the book ‘Adventure in New Zealand’ by Edward Jerningham Wakefield. Edward Jerningham Wakefield was the son of Edward Gibbon Wakefield who was the principle force behind the organized colonization of New Zealand. E.J.Wakefield traveled to New Zealand on the Tory with his uncle Colonel William Wakefield in 1839. The passage on the lower right corner of the painting is a quote from this book which really struck a chord with me. In January of 2007 I went to Queen Charlotte Sounds and Ship Cove; whilst there I stood on the beach and contemplated Cooks arrival; the garden he planted and the small structures that had been erected. When I returned back to Wellington I began to read ‘Adventure in New Zealand’ and had to smile to think that no less than 168 years earlier E.J.Wakefield had done the exact same thing! 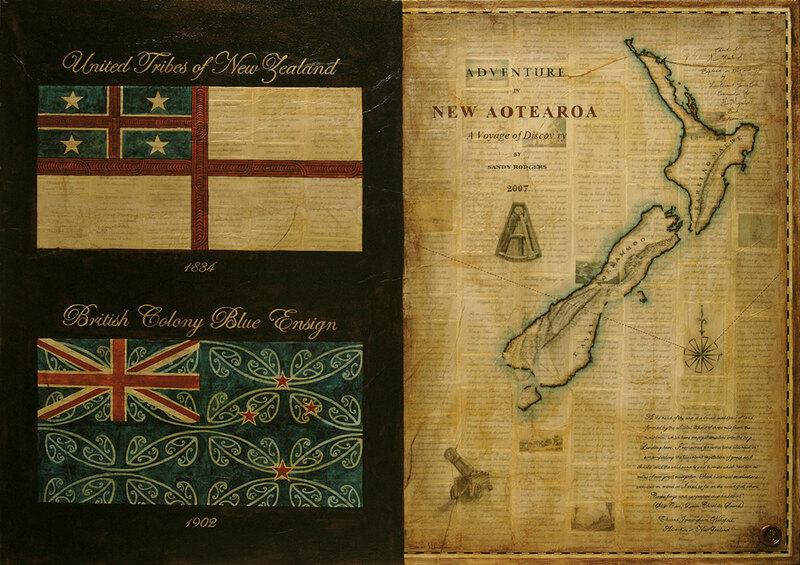 – The map is based on a copy of Cooks original charts of New Zealand that I bought whilst at Waitangi house in the Bay of Islands. – The cannon in the lower centre is one of two that are protecting the monument at Ship Cove today.